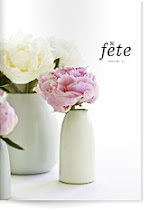 It is with much excitement Annabelle and I have launched a special issue of fête - just in time for Christmas. We really hope you'll enjoy this taste of what's to come in the new year with the first of our bi-monthly online issues releasing in February 2012.
lovely work, jane! the christmas issue is a delight + i look forward to many more issues of fête. Congratulations! What a fabulous magazine. Looking forward to more issues. Gorgeous! Thankyou for sharing this with us - we are very lucky! Love this magazine, beautiful work.